SHANGHAI, Jan. 29, 2019 /PRNewswire/ -- Hotel Plus – Shanghai International Hospitality Design and Supplies Expo (HDE), the comprehensive hotel show in China, is pleased to announce that a number of exciting companies and leading brands have joined the expanded line-up of new exhibitors for 2019. Professionally organized by UBM Sinoexpo with the strong support from China Tourist Hotel Association, HDE takes place on April 25 – 27 at the spectacular Shanghai New International Expo Centre. HDE 2019 boasts a diverse roster of local, national, and international companies involved in hotel projects and commercial properties with over 800 exhibitors in 8 halls, covering the exhibiting space of 80,500 square metres. Visitors will learn the up-to-date materials for space design – from lighting, sanitary wares and decorative accessories to fabrics, floor coverings, tiles and architectural elements – over the course of 3 days. The community of exhibitors include several big names in the industry both from China and overseas. The most welcomed exhibits categories and representative companies are listed in the following. Lighting design and luminaries: Megaman, Simon, Comely Lighting, Huayi Lighting, PAK, TONS, Flua S.r.l., 5057 New Media, R&C Deco Lighting, Aplus Lighting. 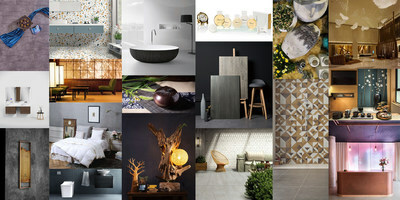 Ceramics and tiles: Mati, Overland, Florina, Belite, Damia, Element, Giania, Muzzi, Padua, Tuttobene. Bathroom and hardware accessories: Tenne, Munk, Wisdom, Gunon, Coold, Gabo, Fabia, Pensen, Johper. Floor coverings and wall decoration materials: Durasein, Greatart, Jetcoat, Tianyang Wall Cloth, DMVP Timber Bamboo, Boda Wood, Mufengzhai Wood, Green Simple, Showay Tech, YATE Wall Paper. Fabric soft decorations: Clean Brands, Shengmian, Canasin, Yuanzhicheng, Huade Carpet, Downland Bedding, Honren, Sunflower International, ABC Rugs, Aviva Enterprise. Air-conditioning and HVAC equipment: Daikin, Panasonic, GREE, Haier. There are also world renowned project suppliers will exhibit in the show for first time including Häfele, Colcom, Sugatsune, Topciment, Soundbox, Losberger and domestic premium companies such as Pusu Design, Fi-fan Furniture, Zihui Art, Zhu Bingren Copper, Dasheng Signs and PAD Auto Door. Guestroom consumables and hotel amenities are the other important part of the expo. Providers who will bring their latest in collections are including Group GM, L'Occitane, La Bottega, Ada International, Italtrim, Okina, Ganbor, Tonney, DeRucci, Technogym, Amer Sports, Dellware Electrical Appliance, Salto Systems and Cetis Hotel Phones. Complementing the exciting new exhibitors that have been recently added to the expo, the Mockup Room Show is also prominently featured at HDE 2019. The show is the best stage to visualize innovative ideas of hotel brands and designers, creating a real scenario for the application of building materials and supplies. More than 20 companies participate in the Mockup Room Show including hotels and design firms such as Fairfield by Marriott, Hampton by Hilton, Dossen Hotel Group, New Century Hotels and Resorts, Shimao Star Hotels Group, Landison Hotels and Resorts, CROX, Heyplus, Daguan Design Association and The Scale Art Design Corporation, among others. 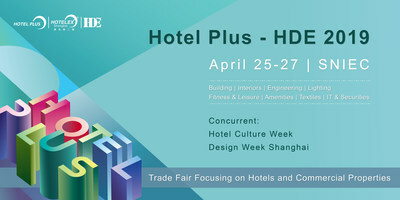 Over 15,000 industry professionals have already registered to visit Hotel Plus – HDE. It is estimated that there will be 140,000 visitors this year. Hotel Plus - HDE is a one-stop purchasing platform offering building materials and supplies for Hotels, Restaurants, Clubs, Retail Shops, and Shopping Malls. Go to www.hdeexpo.com/en-us for free tickets and further details, and follow @HDE_Event #HotelplusHDE2019 on Twitter.